Colorado national parks and monuments provide special activities for kids. 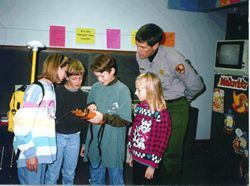 The most popular of these activities is the Junior Ranger Program for children from age 3 to 12. Required activities and age range to achieve this title vary at different parks. At Mesa Verde National Park, for instance, children 4 to 12 complete a Junior Ranger application and are awarded a certificate and badge. At Great Sand Dunes National Park, children 3 to 12 complete a Junior Ranger book to earn a badge by identifying plants and animals. In addition to the Junior Ranger program, other activities also are available. At Rocky Mountain National Park, children can visit the Discovery Room where they can explore animal skins and other items. Or, they can become a WebRanger by helping to count elk.